Marantz M-CR611 review | What Hi-Fi? The Marantz Melody all-in-one systems have always been pretty solid performers in our tests, most recently winning Awards in 2011 and 2013 (with the M-CR610) thanks to their do-it-all listenability. This year’s M-CR611 delivers a refined design and a boosted spec list. But is this enough to keep up Marantz’s winning ways in an increasingly busy streaming market? Cosmetically, very little has changed. It’s still a glossy but largely plastic box which, although sturdy, might not be the premium finish people expect for £500. Look closer though, and you’ll see a few aesthetic changes, such as new coloured illumination strips on the front, which can be dimmed or turned off completely, and a new acrylic top cover to guard the unit against scratches. Add a new mint green colourway available for the front panel, and it certainly seems Marantz is targeting its new Melody range at a younger audience than before. However, it’s connectivity that sees the most changes from the previous model. As well as being able to play CDs and stream music up to hi-res 24-bit/192kHz from networked devices, the M-CR611 now offers Bluetooth with NFC and Spotify Connect functionality, alongside two USB inputs (front and back) for connecting an Apple device or USB stick, an analogue in and two digital optical inputs (up from one last time). File format compatibility has been stretched a little as well, this system now supporting AIFF hi-res files as well as WAV and FLAC, plus DSD 2.8MHz to boot. That’s a lot to offer in a single, compact box. Quick setup has the M-CR611 up and running on our network within minutes. The front panel display (rather than a combination of flashing LEDs) helps with this, and with navigating around the various inputs and browsing music libraries. A remote control is included. 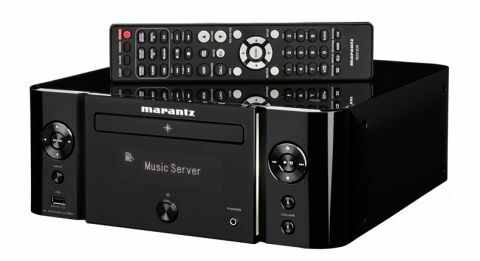 A quick download of the new Marantz Hi-Fi Remote app for Android and iOS offers you all that information on your phone or tablet too. Play a CD and we’re greeted with a familiar smoothness and relaxed character as found on the 2013 model. That’s great when it comes to listening over long periods, and lends itself well to the laid-back tones of Lana Del Rey, but perhaps not so well to Eminem’s venomous Relapse album. Tracks like Crack a Bottle, with its big, pounding bassline, ask for a little more bite to their presentation than the Marantz can muster. It’s not that the low end is lacking, it just lacks the precision and punch to make it really articulate. It’s a clean, refined sound, with plenty of scale and a good level of detail. No part of the frequency range feels too prominent or overlooked, and the smoothness of its character means it never sounds harsh at volume. Whether we switch to a track from our music server or stream tunes via Spotify Connect, the performance is similar throughout. Its presentation means it’s a forgiving listen for lesser quality streams and recordings too. We dig out an M-CR610 to see how it compares to its successor and we’re surprised to hear that the '610 actually has a touch more get-up-and-go. It’s tonally more forward in its presentation, making it a slightly more entertaining listen. The M-CR611 is a touch more refined, but if anything, we’d much prefer it roll up its sleeves and offer some extra dynamism and insight instead. There’s no doubt that the M-CR611 is an extremely tempting buy based on its feature list alone, but we wish it had more sonic attack to back it up. Yes, it’s easy to listen to, but we want something more from it in order to hold our interest over longer listening periods. Although it offers a lot of features for its price tag, it needs a little more in the sonic stakes. Ultimately, that loses it a star.